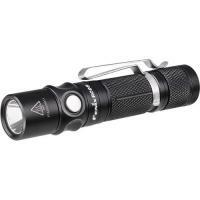 The Fenix RC05 is a compact, portable flashlight that is perfect for everyday carry or travelling light. Its 14500 lithium battery can be recharged from any USB port using its micro-USB charging cable, and it can also be powered using an ordinary AA at reduced performance if necessary. Its bright white LEDs can run in four different power settings, accessible from a convenient single switch, and it also features a lock-out function to prevent it from being activated by accident. The flashlight also has a strobe mode for signalling. It is made from rugged aircraft-grade aluminum, coated with a wear-resistant hard-anodized finish. The lens is durable toughened glass, with an anti-reflective coating for maximum lighting efficiency. It is built to keep out water, with an IPX8 water resistance rating and capable of continued use at up to two meters depth.